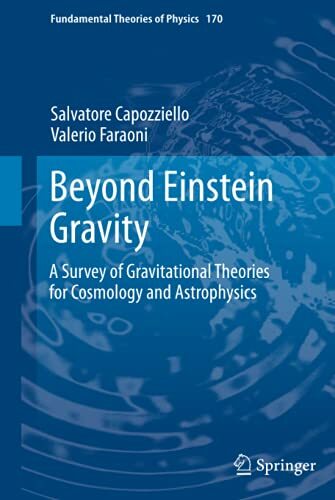 [PDF] Beyond Einstein Gravity: A Survey of Gravitational Theories for Cosmology and Astrophysics (Springer Fundamental Theories of Physics) | Free eBooks Download - EBOOKEE! Description: Beyond Einsteinâ€™s Gravity is a graduate level introduction to extended theories of gravity and cosmology, including variational principles, the weak-field limit, gravitational waves, mathematical tools, exact solutions, as well as cosmological and astrophysical applications. The book provides a critical overview of the research in this area and unifies the existing literature using a consistent notation. Although the results apply in principle to all alternative gravities, a special emphasis is on scalar-tensor and f(R) theories. They were studied by theoretical physicists from early on, and in the 1980s they appeared in attempts to renormalize General Relativity and in models of the early universe. Recently, these theories have seen a new lease of life, in both their metric and metric-affine versions, as models of the present acceleration of the universe without introducing the mysterious and exotic dark energy. The dark matter problem can also be addressed in extended gravity. These applications are contributing to a deeper understanding of the gravitational interaction from both the theoretical and the experimental point of view. An extensive bibliography guides the reader into more detailed literature on particular topics. No comments for "[PDF] Beyond Einstein Gravity: A Survey of Gravitational Theories for Cosmology and Astrophysics (Springer Fundamental Theories of Physics)".